Even if you are not a Hill staffer, a lobbyist, or a person who voted in the last election (in which case, who are you!?! ), it is pretty much impossible to turn off the constant barrage of politics in the capital. Even if you refuse to read the newspaper “because it’s depressing” you know more about various scandals and insider backbiting than anyone in her right mind could wish to. DC politics is the radio station that cannot be turned off. Most everything in DC is somehow shaded by politics. As bizarre as it seems, even the hottest men in town are somehow drawn from a political pool. The West Wing this is not, friends. In the same way that some law students go to law school after watching one too many episodes of The Practice, these big-eyed idealists have come to Washington to drink lots of coffee late into the night and make sure that CJ communicates what the President’s agenda really is. Town gossip, also, is dictated by politics. Though no one has heard what the two mayoral candidates’ real plans for leading the city during a recession are, most people know who they like. When Fenty’s bikes get stolen from his home, one half of the city titters; when Gray’s house is broken into, the other half smirks. What does this have to do with politics? Good question, my astute reader. But it is there. What else you say? What else?! You have only to see the turn one of my favorite painters has taken recently. 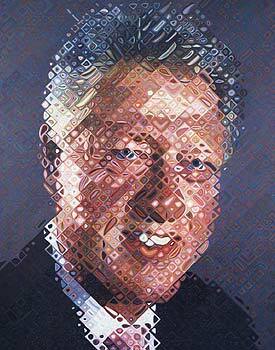 Et tu, Chuck Close? Yes, art imitates life here in Washington. What can you do, dear reader? Well, you can either skip town or get on the bandwagon. This wonky train has left the station and you better be on board. I suggest you start reading Wonkette and going to happy hours at the Hawk and Dove. If you can’t hack it, stay indoors until the next exceptional weather event distracts everyone’s attention from anything else.